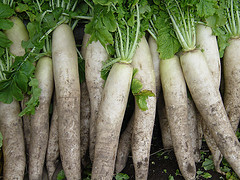 Daikon radish is also known as Oriental radish, or Chinese radish. Daikon has high water content and is very low in calories. Daikon is rich in vitamin C, potassium and folate and a good source of magnesium. Regular intake of daikon together with the leaves helps prevent the common cold, flu and respiratory infections. Daikon treats hangovers, sore throats, colds and edema, and it helps cleanse the kidneys and decongest the lungs. This restorative vegetable also has anticarcinogenic properties. Daikon can be use as a remedy for asthma & bronchitis, weight loss, colds or sore throats, and as a digestive aid. How to prepare this vegetable for food? This is an extremely versatile vegetable that can be eaten raw in salads or cut into strips or chips for relish trays. Use the daikon as you would a radish. It may be served raw in salads or grated for use as a condiment (if you don't have a Japanese-style grater, use a cheese grater and grate just before serving), pickled, or simmered in a soup. They are also preserved by salting as in making sauerkraut. To prepare, peel skin as you would a carrot and cut for whatever style your recipe idea calls for. Daikon radish is white, with a peppery taste.